After my discussion with Nophead in my previous post I realised that my attempt to compensate for hole shrinking was flawed. It seems that the dominant effect wasn’t what I thought but turned out instead to be the number and order of perimeters I was using in my Slic3r settings. This has already been researched before, but I decided to investigate it further. This time I used RapCAD to generate the test pieces since its multi-material support made creating the Slic3r print modifiers a doddle. I decided to use square holes since I can then measure them accurately with a digital vernier calliper. Because of the way Slic3r handles multi materials, and modifiers I had to export the main() part first, then comment it out and export the mods() as a separate multi material part. I applied the mods such that the first hole had 1 perimeter, the second 2 perimeters, etc. up to 5 perimeters. Unfortunately Slic3r decided to add extra perimeters internally to the part. 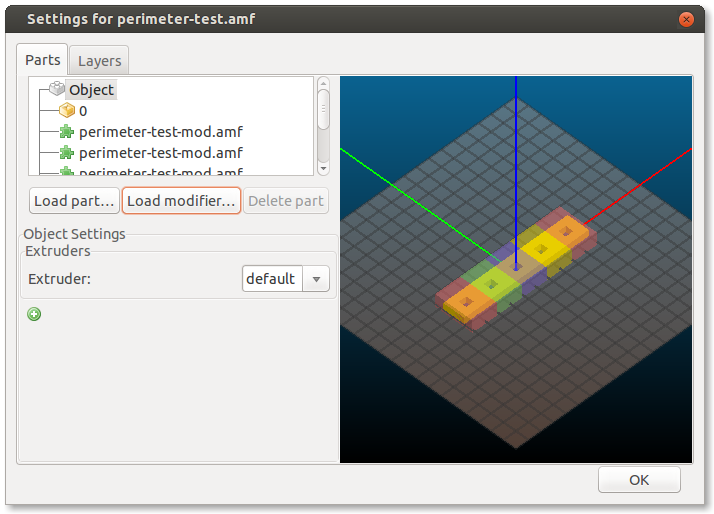 This is probably a Slic3r bug but not a problem for this test piece. 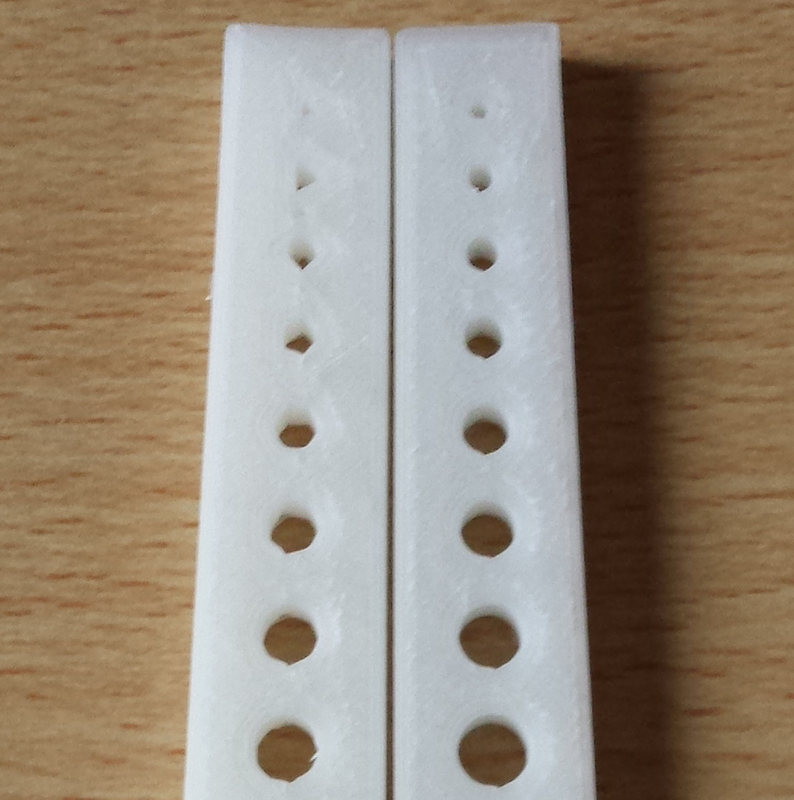 I printed the parts out and took 4 measurements of each hole, 2 widthways and 2 lengthways. I then took the average of these four measurements and subtracted them from the specified width of 6mm to get the error. I divided this value by two since this error is doubled up, (there are two sides to the hole). The red line shows the results from a second test piece in which the “Print outer perimeters first” setting was used. So in summary I don’t think I’ve learned anything new here. Outer perimeters first seems to be the solution as has been suggested before. I was quite surprised to find that the error to perimeters relationship is not linear, but this might be due to errors in measurement, since there is a straight line that goes between all the error bars. Posted on February 14, 2016 February 16, 2016 Categories RapCAD, Reprap6 Comments on The effect of extra Perimeters in 3D printing. Some time ago Nophead did some experiments to investigate why holes printed by reprap machines come out undersized. I’ve also noticed this in my prints and have in some cases manually just ‘added a bit’ and re-printed the part. This isn’t very methodical so I decided to give Nopheads polyholes compensation a try. However even on paper the hole sizes suggested seem to be lower than some of the values I found by trial and error. 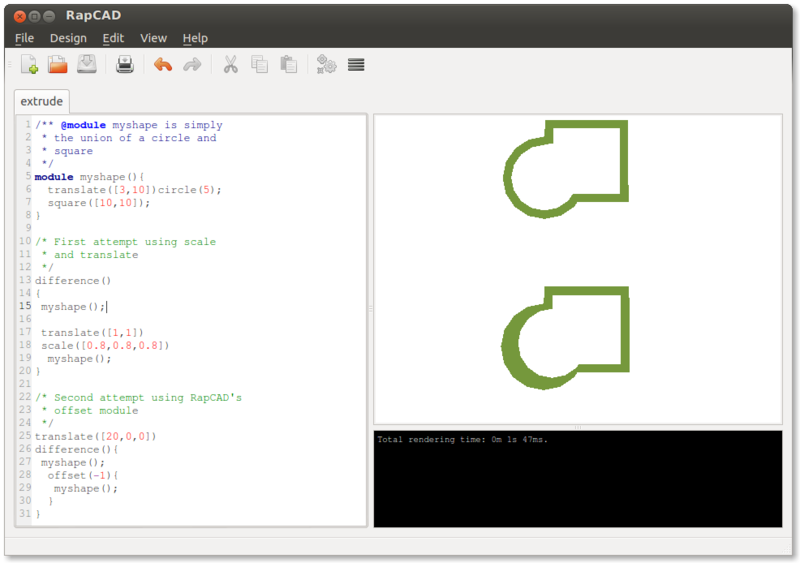 I decided to do a formal test and came up with the following OpenSCAD script. 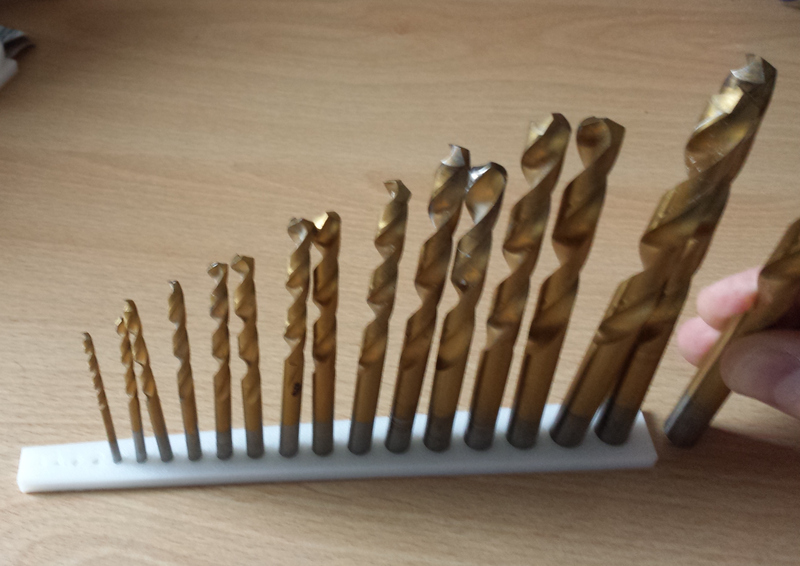 I have a full range of 19 drill bits from 1mm up to 10mm in 0.5mm increments. The polyholes function is left untouched from Nopheads original and the rest just creates a nice shaped test piece. 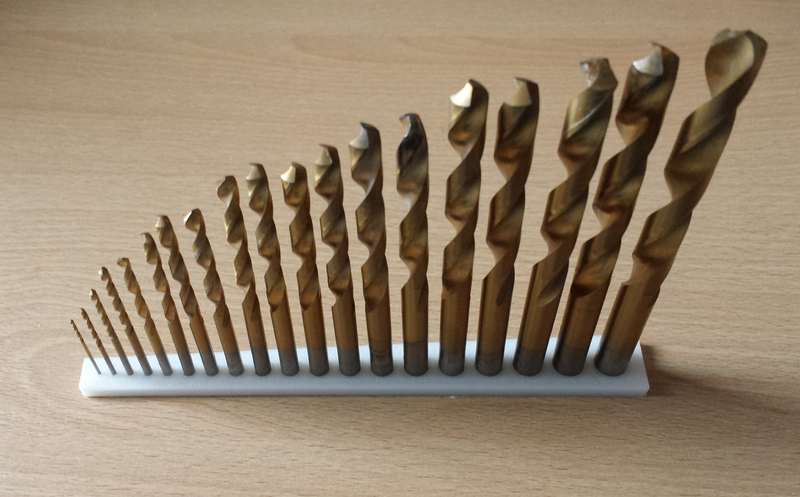 Unfortunately the test confirmed what I suspected, and not a single drill bit fit in my test piece. In fact I had to shift all the bits up one space, the 9.5mm bit fitting into the 10mm hole and so on. For the smaller hole sizes even this didn’t work. The faceting error comes about from CAD programs using the outer circumcircle as the basis for the radius of the polygon. For values of r between 1mm and 20mm, and a tolerance of 0.1mm this gives values for n ranging between 7, and 23. This brings me on to segment pausing. I find it hard to believe that current reprap electronics will have significant delay when trying to produce 23 short line segments. Nophead dismissed this since his electronics were very low latency, and so will I. The next factor is arc shrinkage. I found it quite odd that Nophead acknowledged this factor and referenced Adrian Bower’s calculations which compensate for this, but then dismisses it because the numbers come out too small. 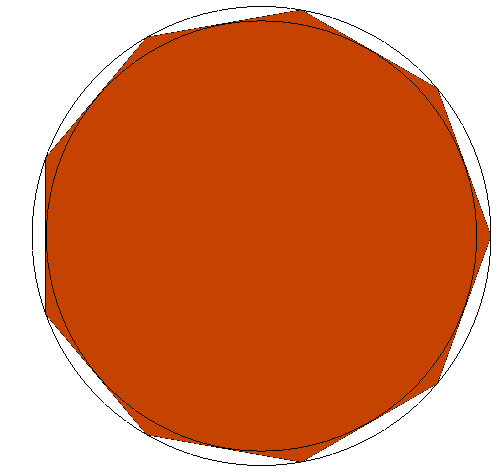 It occurred to me that Adrian’s calculations are based on a perfect circle, and so the faceting error calculations have to be used in conjunction with arc compensation. Every drill bit fit snugly in the hole it was meant for. Even the small sizes worked surprisingly going down to a 1mm drill bit. But wait… I haven’t accounted for corner cutting. Well this is the aspect where I think I am going to have to disagree with Nophead. Not least because I didn’t account for it in my test above, but also because the assumption is that the filament is being stretched as it goes round corners, and this seems wrong to me. Surely the filament should be being extruded at a rate equal to the motion of the nozzle so that no stretching should occur. In fact in contrary to this Slic3r utilises a faster motion than the extrude rate to deliberately stretch the filament for making bridges, but not during normal perimeter generation. Its odd because Nophead says this is this is the dominant effect on his machines, and is the main justification for using less facets for the holes. Perhaps his extrusion rate is lower and so the filament does get stretched. 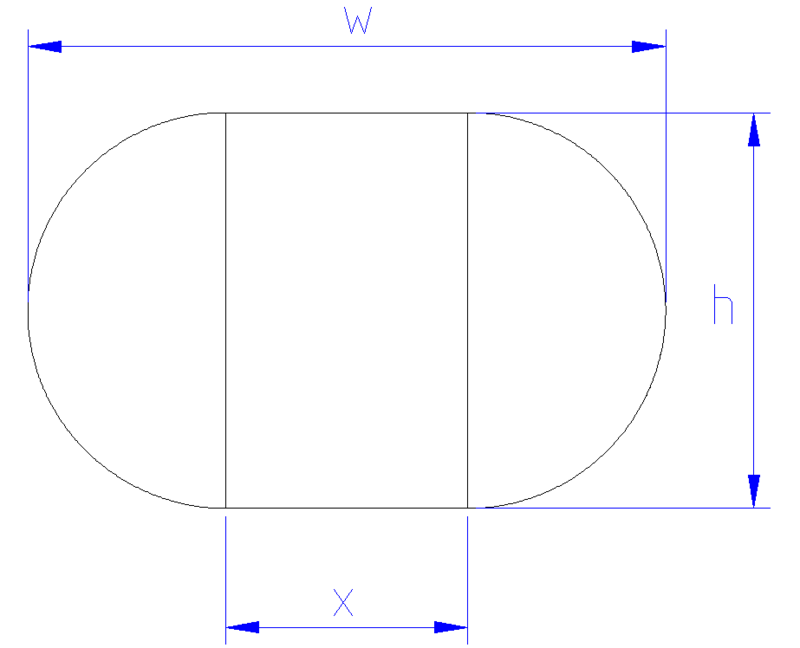 For holes below 2mm in diameter Nophead’s formula says you need 4, or 3 facets, which are not really holes at all. I would argue that smaller holes require a higher tolerance to produce accurate results, and from the formula for n above that means you need more facets, not less. For a while now I have been using VirtualBox to run various windows guest operating systems on my Linux host. One thing that I have always been wary of when using them is how the disk image gradually grows over time. This is because on the host operating system the disk container uses a sparse file so that the virtual disk can appear to be bigger than it actually is, but it can only do this when the guest operating system is not using the space, and the data is effectively set to zero. When you delete a file on the guest operating system it doesn’t bother to set the file contents back to zero, it just removes the record of where the files data was located. the space can be reclaimed. However in windows there is one file in particular called pagefile.sys (also known as the swap file) that is constantly being written to and then subsequently erased. Its possible that windows does this intelligently and re-uses the same sectors of the virtual disk for the pagefile, but it seems more likely to me that windows doesn’t do this, after all it isn’t aware that its really writing to a virtual disk. What made sense to me was to create a second virtual disk specifically for the pagefile. I made the second disk image immutable. What this means is that all writes to the disk are stored in a differencing image which is thrown away when the guest machine reboots. Because of this I can ensure that it never gets any bigger. This also has some other advantages. Firstly I can use the same immutable image for all my Virtual machines. These currently include; Windows XP, Windows 7, Windows 8.1, and Windows 10. Secondly because the image is immutable it allows all guests to use the image while all running at the same time. Thirdly the fun part, I can host the differencing images to the immutable base image in tmpfs meaning that the guests get the advantage of having very fast i/o for their pagefile.sys. This is the advantage I like the most because it certainly seems to improve performance. I have decided to move the RapCAD website to a new hosting solution. There are two reasons for this, firstly I don’t see the need any more to host two separate blogs, and secondly because the new solution is cheaper. As a result of this change the bug tracker and forums have gone, (they were not being used anyway) and git hosting has moved primarily to github.